The Bank of Ideas was an organisation that squatted in a disused office complex in the City of London, England. It remained in the building from November 2011 until January 2012. The building was owned by UBS, and the squatters were members of the Occupy London protest movement. The building was described by an Occupy London spokesman as "a space for political discussion". The Bank's website stated that its purpose was to host "the non-monetary trade of ideas to help solve the pressing economic, social and environmental problems of our time" and referred to itself as a "public repossession". The idea of "repossessing" bank property, according to one member of the movement, was in response to bank takeovers of households behind on their mortgage payments. Drugs and alcohol were forbidden at the Bank of Ideas, as was all commercial activity. Bank of Ideas continued to engage in organized meetings, events and actions until about March 2012. The building on Sun Street was occupied by protesters from November 2011. The Bank hosted teach-ins and seminars on various social, economic and political issues. Other events included a mock trial of the United Kingdom government for alleged war crimes conducted during the War in Afghanistan, a screening of the BAFTA-winning film How to Start a Revolution and a free performance by the bands Radiohead and Massive Attack. 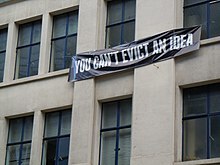 All seminars and events at the Bank of Ideas were suspended indefinitely after a court approved UBS's request for the organization's eviction on 26 January 2012. The Bank of Ideas encampment was evicted from the site on 30 January 2012. While most of the organization left peacefully, clashes between law enforcement and other squatters in the office complex led to the arrest of one bailiff for assault. ^ a b c d Lizzy Davies and Peter Walker (30 January 2012). "Occupy London: evicted protesters criticise bailiffs' 'heavy-handed' tactics". The Guardian. Retrieved 30 January 2012. ^ a b Paul Owen and Peter Walker (18 November 2011). "Occupy London takes over empty UBS bank". The Guardian. Retrieved 21 January 2012. ^ a b "Welcome!". Bank of Ideas. Retrieved 21 January 2012. ^ "Bank of Ideas: Events". Bank of Ideas. Retrieved 5 March 2012. ^ a b "Events at the Bank of Ideas postponed". Bank of Ideas. Retrieved 30 January 2012. ^ Live Show [livestream] Thu Jan 19 2012 05:53:56 AM. Livestream. 19 January 2012. Retrieved 21 January 2012. ^ Johnny Howorth and Elliot Smith (7 December 2011). Radiohead and Massive Attack play at Occupy London Christmas party - video. The Guardian. Retrieved 9 December 2011. ^ Alex Moore (7 December 2011). "Thom Yorke and Massive Attack DJ a Christmas Party at Occupy London". Death + Taxes. Retrieved 9 December 2011.